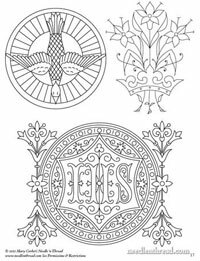 Church Patterns is a printable collection of over 120 ecclesiastical designs suitable for hand embroidery, appliqué, paper crafts, painting, and all kinds of other arts & crafts. This collection represents the translation of church designs (from out-of-copyright publications circa 1800’s – early 1900’s) and photos and sketches (from my own study & exploration) into clean patterns that will reduce or enlarge and keep their linear integrity. The collection is intended as a sourcebook for artists and crafters interested in Christian motifs. Here are some samples from the 120+ patterns that you’ll find in the book! 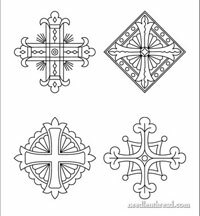 Available in PDF format for easy download and printing, Church Patterns contains a variety of crosses, symbols, sacred monograms, borders, corner designs, and bands that range from simple to complex. 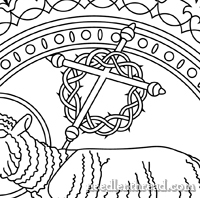 Whether you are looking for ideas for embroidering church linens or vestments, or you want to make large banners or small religious greeting cards, you’ll find plenty of inspiration in this collection of clear line drawings. Besides plenty of crosses, you’ll find other symbols that are often used in church adornment. Some of the designs can easily be adapted to secular (non-religious) use as well. 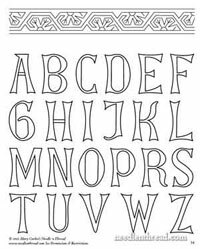 There’s even an alphabet, perfect for banner making. The designs are drawn in a crisp, clear line format and are easily enlarged or reduced on a photocopy machine or your own home printer. 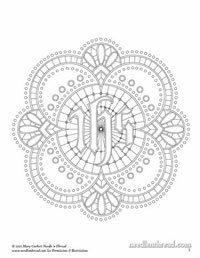 You can see a sample of the quality of the PDF drawing by viewing this cross and lily pattern (PDF) for free. Church Patterns: Book One is available now for US$15.00 (less than 15¢ for each design). You’ll receive all 120+ designs in a 38-page downloadable PDF which you save to your computer, so the designs are handy whenever you need them. You can choose which pages you need to print, rather than printing the entire publication at once. The entire check-out & delivery process is automated. This means you can print and use your new designs right away. You will be directed to my online shop, where you can pay either through your Paypal account or with a major credit card. Once you complete your purchase, you will receive an e-mail link to download your pattern. You will need Adobe Reader to open Church Patterns. If you do not have Adobe Reader, download it free through Adobe.